Praying and Shopping ... ? I was in my cubie finishing up some work after office hours around 7pm when I hear continuous short bursts of laughter coming from the cubie behind me. Checked out what my colleague was doing and he was watching this video clip from Google. Got him to send the link to me before I left ... yeah, he was still laughing when I left! Took a look at the video and this guy is absolutely hilarious! Wifey enjoyed it too! Got to know of these recently. I am not a perfectly religiously sensitive person, but I do have good friends who are Muslims and I love their food. The first audio/video clip, whether is it real or not, I don't know. But if you are religiously sensitive, please stop right here (or u can jump to the second one). Went to Bugis this morning. 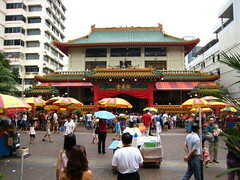 Firstly, went to the Waterloo street temple and the prayer "outsourcing" shops to "pray" for a good year ahead. Wifey bought a fengshui windchime for the home. (Which reminds me, later got to modify it as it doesn't seem to be chiming away right now) There were lots of people collecting donations and even street performers, imagine that! 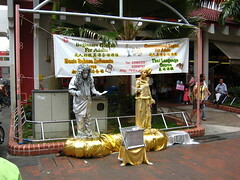 Anyway, later was the more interesting part, shopping at Bugis Junction. Not too bad a haul today after 2-3 hours, managed to get some pretty good deals. After that, Wifey wanted to go NLB after that but we gave it a miss as the carpark was full and there were a queue of cars waiting to go in. Never knew the library was so popular on weekends! 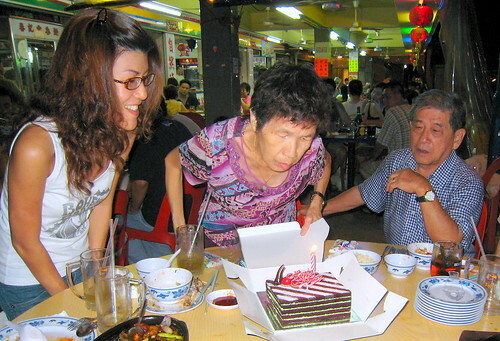 Today we celebrated MIL's 66th birthday at a nice little coffeshop at Stirling Road near their home. The coffeeshop is at Block 164 and the name is "自然海鲜". The food was reasonable and service was not bad. Unfortunately I was too busy eating to remember to take some photos of the food. Well, at least I didn't forget to take MIL and her cake. Haha! Got this interesting gadget which I bought from eBay today. Essentially it is an FM Transmitter which fits into the vehicle 12V socket. The transmitter has a USB port which is meant for plugging in USB Flash Disks (i.e. Thumb Drives) or any portable disk supporting the USB interface. What this means is that you can copy your favourite songs into your USB flash disk, go to the car and plug it into this gadget. Then this device will play your songs on the USB flash disk and transmit it wirelessly via FM to your car radio. It also comes with a small remote control so that you can easily scan << or >> for your songs! There are a number of models to choose from, some even have an LCD which displays the info of the song currently playing. As I wanted to try out the quality, I bought the cheapest which only has a simple LED display. Oh yes, it also has an audio input cable to which you can plug your MP3 player (such as an iPod) and it will transmit the audio to the car radio. Can easily find them on eBay, like THESE. I was sitting in my cubie doing some work when all of a sudden I felt "giddy". Felt like I was on a boat or something. After that I looked around and saw a couple of puzzled faces. Asked my neighbour and he said he felt it too. There was a fish tank behind me and at one point it was so bad that the water was almost spilling out of it. Some of the lights were swaying too. We were only on the 8th floor, wonder how much difference it would be in a much taller building. Anyway, back in the office and think it should be safe now. I am finally back from HK after business. Things went as well as we could hope for. Anyway, after the official business was done, we had a mini celebration/thank you dinner at Sai Kung Town, famous for their seafood. 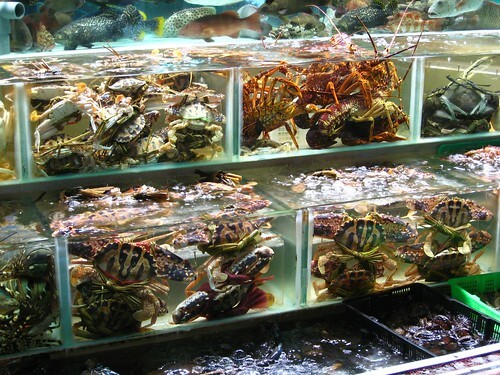 Although I am not a seafood fan, I was impressed by the variety of live seafood on display. I don't think you will ever see such a sight in Singapore or Malaysia. It looked more like an aquarium than a seafood restaurant. They even had Moray Eels and Stonefish for the picking! All these washed down with several glasses of TsingTao. Check out more photos of the restaurant HERE. After the seafood session, it was down to the local pub for some drinks. Not very happening though. Anyway, since it was mainly guys, it was Darts and Pool all evening.